Mercedes-Benz Is America’s Best Selling Luxury Car for Third Year Running. Daimler brand beats BMW by fewer than 5,000 vehicles. Audi stumbles, reports its first annual drop since 2009. Daimler AG’s Mercedes limped a bit over the finish line with a 9.1 percent drop in December. The 315,959 cars and sport utility vehicles the brand delivered last year still were 4,945 more than BMW AG’s namesake division. BMW was the only one of the four biggest luxury brands to increase sales in 2018. 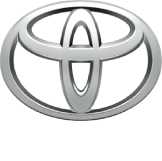 For the second straight year, Toyota Motor Corp.’s Lexus division finished third. A 2.2 percent decline for 2018 dropped the brand further back from the German front-runners. Volkswagen AG’s Audi stumbled at the end of the year with declines of 16 percent in December and 11 percent in November. The brand ended 2018 down 1.4 percent, recording its first annual drop since 2009. But The Best-Selling Luxury Cars and SUVs of 2018 by car and driver is a Little different. As in the mainstream, crossovers dominate the list. But the top seller is somewhat of a surprise. 2018 wasn’t the best year for luxury automakers in the U.S. 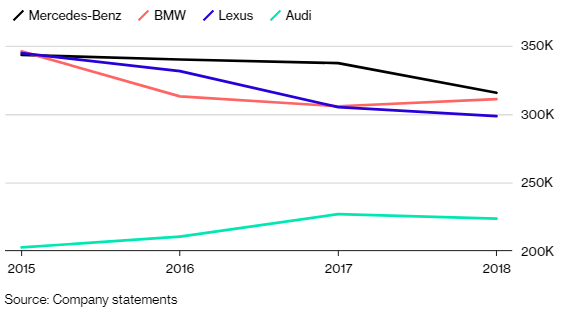 Many of the major players, including Lexus, Mercedes-Benz, and Audi, posted declines compared with last year. BMW was the key exception, posting a slight increase, as did smaller players Acura and Infiniti. As in our ranking of mainstream best-sellers, the list of most popular luxury vehicles shows a pronounced shift towards crossovers and away from sedans. And Tesla has proven to be a formidable—if unconventional—player in the sales race, as you’ll see by the end of this ranking. The A4 sedan was once Audi’s bread and butter, but it’s not the brand’s best-selling model anymore—that would be the Q5 crossover you’ll find higher on this list. We’ve combined A4 sales with the A5 range, which includes coupe, convertible, and hatchback bodystyles, to match Mercedes-Benz, which reports sales of all C-class variants together. Cadillac’s attempt to reinvent itself as a legitimate BMW competitor hasn’t paid off in the showroom. The sporty ATS and CTS sedans have been slow sellers, and meanwhile Cadillac’s top-selling vehicle is the cushy, decidedly non-sporty XT5 crossover, which competes with cruisers such as the Lexus RX. The little sibling to the perennially popular RX, Lexus’s size-small NX crossover has surpassed the ES sedan to become the second-best-selling Lexus. In 2019, it could face some internal competition, however, now that the even smaller UX has gone on sale. Acura still sells cars, but its crossovers, the compact RDX and the three-row MDX, dominate its sales numbers. The RDX, fresh off a redesign, had a particularly strong 2018, with sales increasing nearly 24 percent compared with last year. It may not be long before BMW’s X3 crossover surpasses the 3-series sedan in sales. The new-generation X3, which we’ve combined with its X4 “coupe” sibling here so that it lines up with Mercedes-Benz’s GLC range, was up more than 50 percent in 2018. 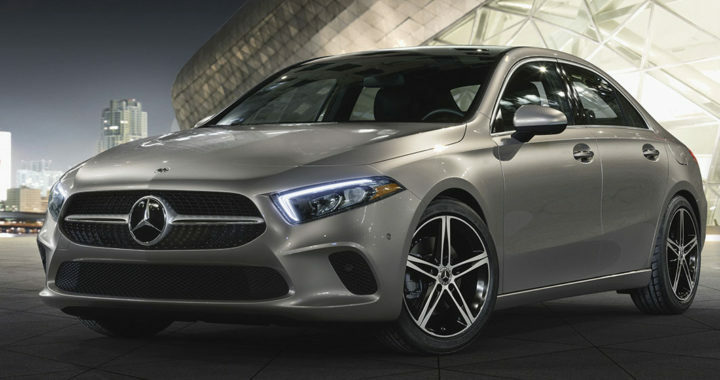 When you think of Mercedes-Benz, you probably think of stately luxury sedans. But the shining sales star of the lineup is the GLC compact crossover. Not only does it compete in a hot segment of the luxury market, the GLC also has a wide variety of models comprising V-6 and V-8–powered AMG-tuned performance variants and a more rakish “coupe” bodystyle. It couldn’t be much tighter in the sales race between Audi’s popular Q5 crossover and its rival the Mercedes-Benz GLC, as the two were separated by just 251 units. And the Audi triumphed with only one bodystyle (there’s no coupe-like version—yet) and a single performance variant, the SQ5. The BMW 3-series range, once a monolithic entity in the luxury world, is now split into 3-series sedan, wagon, and hatchback models, and 4-series coupe, convertible, and Gran Coupe variants. Both of these model lines posted significant declines in 2018 as BMW’s crossovers gained ground. Lexus tapped into something special when it first started selling the cushy RX crossover in the late 1990s. This defining luxury SUV is no longer innocuous to look at, thanks to its wildly angular styling, but it’s still plush and inoffensive to drive. Sales were strong in 2018, likely thanks to the addition of a new three-row version, the RX L.
While Tesla’s 2018 has been filled with all sorts of manufacturing woes, it was eventually able to ramp up production enough to deliver its new electric Model 3 sedan in significant numbers—138,000 of them, according to Automotive News’ count. We’re curious to see what 2019 has in store for Tesla, as it has cut prices by $2000 to compensate for a reduced tax credit and still promises that the less-expensive Model 3 Standard Range version is on its way. Posted in News and tagged America’s Best Selling Luxury Car, America’s Best Selling Luxury Cars Ranking, Best-selling luxury cars in America, Daimler AG’s Mercedes Best Luxury Car, Luxury Car, Luxury Care, The Best-Selling Luxury Cars and SUVs of 2018, The Best-Selling Luxury SUVs of 2018, Toyota.